Mathematics in Zürich has a long and distinguished tradition, in which the writing of lecture notes volumes and research monographs play a prominent part. The Zurich Lectures in Advanced Mathematics series aims to make some of these publications better known to a wider audience. The series has three main constituents: lecture notes on advanced topics given by internationally renowned experts, in particular lecture notes of "Nachdiplomvorlesungen", organzied jointly by the Department of Mathematics and the Institute for Research in Mathematics (FIM) at ETH, graduate text books designed for the joint graduate program in Mathematics of the ETH and the University of Zürich, as well as contributions from researchers in residence. Moderately priced, concise and lively in style, the volumes of this series will appeal to researchers and students alike, who seek an informed introduction to important areas of current research. Kuksin: Randomly forced nonlinear PDEs and statistical hydrodynamics in 2 space dimensions. Etingof: Calogero–Moser systems and representation theory. Balkema, Embrechts: High Risk Scenarios and Extremes. De Lellis: Rectifiable Sets, Densities, and Tangent Measures. Seidel: Fukaya Categories and Picard–Lefschetz Theory. Schmitt: Geometric Invariant Theory and Decorated Principal Bundles. Lubich: From Quantum to Classical Molecular Dynamics: Reduced Models and Numerical Analysis. Nakanishi, Schlag: Invariant Manifolds and Dispersive Hamiltonian Evolution Equations. Faou: Geometric Numerical Integration and Schrödinger Equations. Sznitman: Topics in Occupation Times and Gaussian Free Fields. Labourie: Lectures on Representations of Surface Groups. Gallagher, Saint-Raymond, Texier: From Newton to Boltzmann: Hard Spheres and Short-range Potentials. Serfaty: Coulomb Gases and Ginzburg–Landau Vortices. Figalli: The Monge–Ampère Equation and Its Applications. Schachermayer: Asymptotic Theory of Transaction Costs. 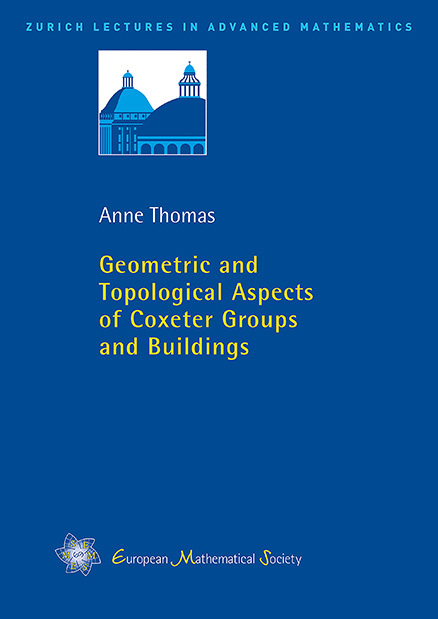 Thomas: Geometric and Topological Aspects of Coxeter Groups and Buildings.